Kumar Galhotra has revamped how Ford runs its business, focusing on profit margins for specific nameplates. He has revamped the 11th floor of Ford's headquarters and holds weekly meetings with small teams specific to each of Ford's U.S. products. DETROIT -- The head of Ford's North America business said the automaker will use the battery-electric vehicle platform underpinning its upcoming Mustang-inspired crossover for a future Lincoln product, but the two will "absolutely" be distinct from each other. 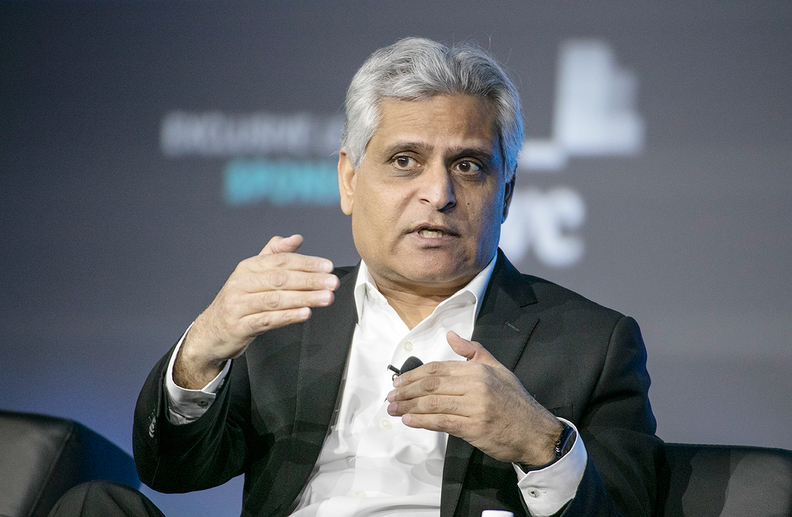 Kumar Galhotra, who led the Lincoln brand before becoming Ford's president of North America last year, said during a presentation at the Automotive News World Congress that Lincoln's battery EVs will stay true to the brand's "quiet luxury" theme, whereas the 2020 Mustang-inspired EV is expected to have an aggressive look that Jim Farley, Ford's president of global markets, compared to a rocket ship. "You can make beautiful vehicles in different ways," Galhotra said Wednesday following his discussion with Automotive News Group Publisher KC Crain. "The BEV technology gives us so much freedom to sculpt that vehicle exactly how we want it. We're going to create elegant Lincoln BEVs." Galhotra declined to put a time frame on a Lincoln battery EV but said he expects it to feature a quiet interior and user-friendly controls. "You have a lot more flexibility," he said. "It's not so much if we're going to be aggressive or not. It's how do we use all those pieces of technology to deliver on the brand essence of Lincoln, which will be understated, quiet luxury." Ford is investing $11 billion in electrified vehicles through 2022, including battery EVs, hybrids and plug-in hybrids. Speaking Tuesday at the Wolfe Research Global Auto Industry Conference here, Hau Thai-Tang, Ford's product boss, said its battery-electric offerings will be "contribution margin positive," a significant step that many automakers have struggled to reach. In roughly 10 months on the job leading North America, Galhotra has revamped how Ford runs the business, focusing on profit margins for specific nameplates. He has revamped the 11th floor of Ford's Dearborn, Mich., headquarters and holds weekly meetings with small teams specific to each of Ford's U.S. products. "I wasn't expecting this magnitude of the sense of ownership these teams have in running the business and improving it," he said. "It's literally unleashing their ideas." It's part of an effort to return to 10 percent profit margins in the region, where it currently trails crosstown rival General Motors. "That fact is very well-known to the entire North America team," Galhotra said. "We need to be better."